BBQ ribs are the holy grail. The tastiest part of the hog. Mastering them marks the difference between the tyro, pyro, and pitmaster. You can make it happen. Here's the real barbecue ribs recipe, good enough to bring home a trophy in a cookoff. 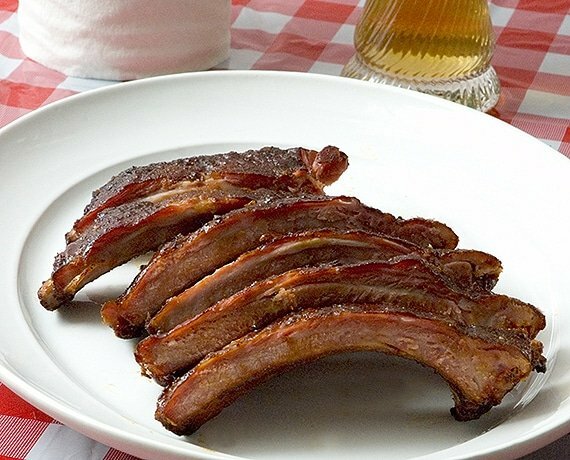 In fact, many readers have done exactly that with this ribs recipe. There may be a few more steps in this process than you like, but it's not hard and we're talking restaurant grade here. Better. You don't need a special smoker, although it helps. You can cook killer real smoked barbecue ribs on most charcoal and gas grills once you understand the concepts. Remember, if you boil ribs, the terrorists win. Click to tweet this. These are the best BBQ pork ribs you will ever eat. There are so good you would ask for them as your "last meal". We're talking classic Southern barbecue ribs here, the barbecue ribs that win barbecue championships. They are a melange of flavors: A complex spice rub, elegant hardwood smoke, tangy sweet sauce, all underpinned and held together by the distinct flavor of pork. They are juicy and tender and they tug cleanly off the bone but don't fall off the bone. Their smoked scent clings to your fingers for hours. Here's a short video that shows the whole process, followed by the recipe, and then a whole bunch of info that will help you up your game. Cooking time. 3 to 6 hours depending on the cut you choose. We will be cooking low and slow at about 225°F, so allow 5 to 6 hours for St. Louis Cut (SLC) Ribs or Spare Ribs, and 3 to 4 hours for Baby Back Ribs. Thicker, meatier slabs take longer, and if you use rib holders so they are crammed close to each other, add another hour. Total time. A maximum of 5 to 6 hours for Spare Ribs and St. Louis Cut Ribs, 4 hours for Baby Back ribs. About the ribs. The jargon butchers use to name different rib cuts can be confusing. Baby backs lie near the spine. Spareribs attach to them and run all the way down to the chest. St. Louis Cut Ribs are the meatiest and most flavorful ribs. They are spareribs with the tips removed so they form a nice rectangular rack. I sometimes call the "center cut ribs". 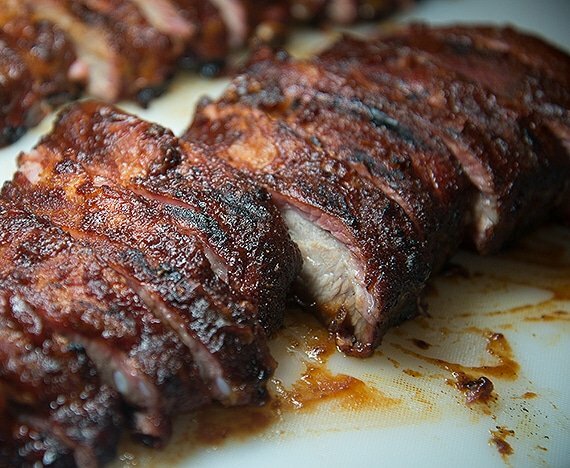 You can use Baby Back Ribs for this recipe if you prefer. They are a bit leaner, smaller, and cook faster. Country ribs are really not ribs, they are chops and should be cooked very differently, so don't use them for this recipe. For more on the different cuts of ribs, click here. Also. 8 ounces by weight of hardwood chunks, chips, or pellets. It doesn't matter how many slabs you are cooking, 8 ounces should be enough. You don't have to be precise, just measure it in some fashion so you have a baseline for your next cook. Then you can add or subtract if you wish. I prefer chunks of apple, oak, or hickory for pork. Never use any kind of pine unless you want meat that tastes like turpentine. Never use construction lumber because it is often treated with poisonous chemicals to discourage rot and termites. You do not need to soak the wood because wood does not absorb much water. That's why they make boats with it. Click the link to read more about wood and the myth of soaking wood. 1) Rinse. Rinse the ribs in cool water to remove any bone bits from the butchering. 2) Skin 'n' trim. If the butcher has not removed the membrane from the under side, do it yourself. It gets leathery and hard to chew, it keeps fat in, and it keeps sauce out. Insert a butter knife under the membrane, then your fingers, work a section loose, grip it with a paper towel, and peel it off. Finally, trim the excess fat from both sides. If you can't get the skin off, with a sharp knife, cut slashes through it every inch so some of the fat will render out during the cooking. Click here to see more photos of how to skin 'n' trim and here's a quickie 1 minute video of the technique. 3) Salt. Salt is important. It penetrates deep and amplifies flavor. It helps proteins retain moisture. And it helps with bark, the desired crust on the top formation. Click here to read more about how salt works. It is truly the magic rock. If you can, give the salt 1 to 2 hours to be absorbed. The process of salting in advance is called dry brining. The rule of thumb is 1/2 teaspoon of kosher salt per pound of meat, but ribs are about 50% bone, so use about 1/4 teaspoon per pound. You can simply eyeball it by sprinkling on the same amount of salt you would sprinkle on the ribs if they were served to you unsalted. If you are watching your salt intake, let's do some math. We recommend about 1/2 teaspoon of kosher salt per pound of meat. That's equivalent to 1/4 teaspoon of table salt. Table salt weights 5.69 grams per teaspoon. But most of us don't eat a whole pound of meat. Say you eat 1/2 pound, that's 1/8 teaspoon of table salt or 0.711 grams or 711 milligrams, or less than 1/3 of your recommended daily intake. Beware of double salt jeopardy! Rubs and spice blends are a great way to add flavor to meat. Commercial rubs almost always contain salt because salt amps up flavor and helps form a crust. Brines are also a great way to add flavor as well as moisture (click here to read about The Science of Brines). Meat that is labeled "enhanced" or "flavor enhanced" or "self-basting" or "basted" has been injected with a brine at the packing plant. You can use a rub on brined ribs, but beware of double salt jeopardy. A salty rub on top of brined or kosher meat can make it unbearably salty. If you use brined or kosher meat and then a rub, you should make your own rub and leave the salt out of the blend. Remember, you can always add salt, but you can't take it away. 4) Rub. Some folks insist on putting the barbecue rub on the night before, but it isn't necessary. The molecules in spices are too large to penetrate more than a tiny fraction of an inch. Read this for the science. Anytime before cooking time, just coat the meat with a thin layer of water. The water helps dissolve the spices. Then sprinkle enough Meathead's Memphis Dust, an award wining barbecue rub spice blend, to coat all surfaces but not so much that the meat doesn't show through. That is about 2 tablespoons per side depending on the size of the slab. Spread the Memphis Dust on the meat and rub it in. A lot of cooks like to use mustard under the rub as a form of glue. Mustard is water, vinegar, and maybe white wine (all mostly water) with mustard powder mixed in. The amount of mustard powder is so small that by the time the water steams off and drips away, the mustard powder remaining is miniscule. My experience is that using a mustard slather makes little or no difference in the final outcome. If you want a mustard flavor, you will do much better by simply sprinkling it on the meat. 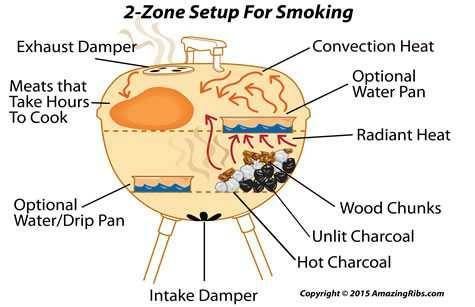 5) Fire up your barbecue smoker or set up your grill for 2-zone or indirect cooking. 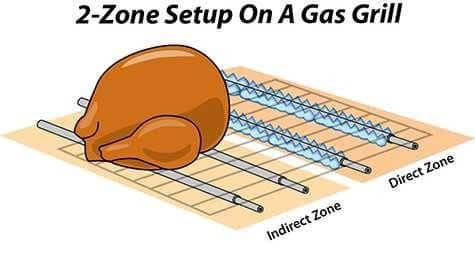 2-zone cooking on a grill is the secret to keeping the temp down so you don't shrink the proteins and make the meat tough. Adjust the temp. Preheat your cooker to about 225°F and try to keep it there throughout the cook. This is crucial: You can absolutely positively noway nohow rely on bi-metal dial thermometers. Even if you spent a fortune on your grill they mount unreliable thermometers on them. If you are not monitoring your cooker with a good digital oven thermometer, you are setting yourself up for disappointment. Using a dial thermometer is like trying to send email with a typewriter. Click here to read my buyer's guide to thermometers. On a charcoal grill, adjust the air intake dampers at the bottom to control heat on charcoal grills. Intake dampers are more effective than exhaust dampers for controlling the temp because they reduce the supply of oxygen to the coals. Take your time getting the temp right. Cooking at 225°F will allow the meat to roast low and slow, liquefying the collagen in connective tissues and melting fats without getting the proteins knotted in a bunch. It's a magic temp that creates silky texture, adds moisture, and keeps the meat tender. If you can't hit 225°F, get as close as you can. Don't go under 200°F and try not to go over 250°F. Click here for more about how to calibrate your grill. To learn more about what happens inside the meat when it is cooking read my article on meat science. Read my article on the thermodynamics of cooking to learn how different grills cook differently. 6) Smoke. Add about 4 ounces of dry wood at this time. Do not soak the wood! This is a myth. Put the wood as close to the flame as possible. 7) Relax. Put the slabs in the cooker in indirect heat, meaty side up, close the lid, go drink a beer, read a book, or make love. 8) More smoke. 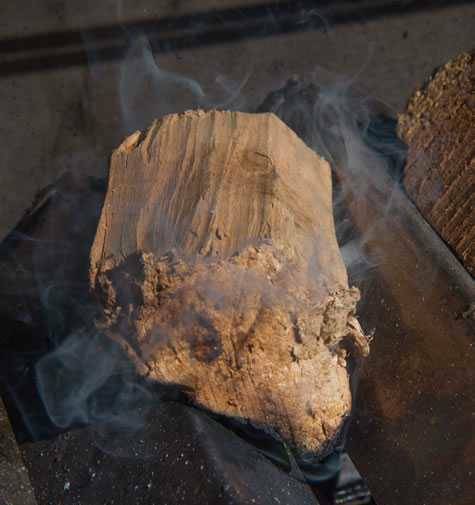 When the smoke dwindles after 20 to 30 minutes, add another 4 ounces of wood. That's it. Stop adding wood. On your first attempt, resist the temptation. Nothing will ruin a meal faster and waste money better than oversmoked meat. You can always add more the next time you cook, but you cannot take it away if you oversmoke. If you have more than one slab on, halfway through the cook you will need to move the ribs closest to the fire away from the heat, and the slabs farthest from the flame in closer. Leave the meat side up. There is no need to flip the slabs. You can peek if you must, but don't leave the lid open for long. 9) The Texas Crutch. This optional trick involves wrapping the slab in foil with about an ounce of water for up to an hour to speed cooking and tenderize a bit. 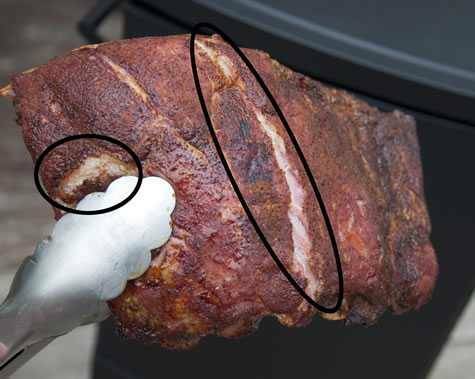 Almost all barbecue ribs competition cooks use the Texas Crutch to get an edge. But the improvement is really slight and I never bother for backyard cooking. If you crutch too long you can turn the meat to mush and time in foil can soften the bark and remove a lot of rub. I recommend it only for barbecue competitions when the tiniest improvement can mean thousands of dollars. Skip it and you'll still have killer ribs. But if you've seen it on TV and must try it, click here to learn more about The Texas Crutch. The Texas Crutch is it is baked into a popular technique called the 3-2-1 method which I do not recommend. Two hours in foil or butcher paper is far too long and can make the meat mushy. Try the Texas Crutch after you master the basics. 10) The bend test. Although I insist that you buy a good digital meat thermometer for grilling, this is one of the few meats on which you cannot use a meat thermometer because the bones have an impact on the meat temp and because the meat is so thin. Allow 5 to 6 hours for Barbecue St. Louis Cut Ribs and Barbecue Spare Ribs, or 3 to 4 hours for Barbecue Baby Back Ribs. The exact time will depend on how thick the slabs are and how steady you have kept the temp. If you use rib holders so they are crammed close to each other, add another hour. Then check to see if they are ready. I use the bend test (a.k.a. the bounce test). Pick up the slab with tongs and bounce it gently. If the surface cracks as in the picture above, it is ready. 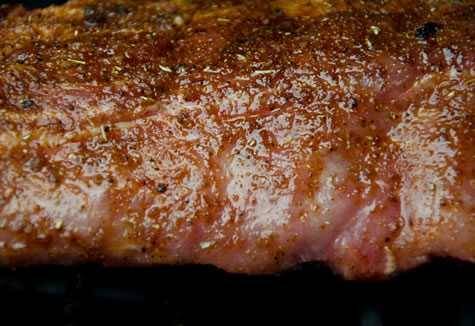 Here are some other tricks to tell when ribs are ready. 11) Sauce. 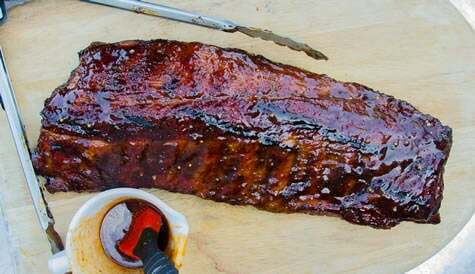 Some folks serve ribs without barbecue sauce, but most folks love their sauce. Just go easy. Let the meat shine through. When the meat is done, paint both sides with your favorite home made barbecue sauce or store-bought barbecue sauce and cook for another 15 minutes or so. Don't put the sauce on earlier than then. It has sugar and there is a risk it can burn. Now here's a trick I like: Sizzle on the sauce. Put the ribs with sauce directly over the hottest part of a grill in order to caramelize and crisp the sauce. On a charcoal grill, just move the slab over the coals. On a gas grill, crank up all the burners. On a water smoker, remove the water pan and move the meat close to the coals. On an offset smoker, put a grate over the coals in the firebox and put the meat there. With the lid open so you don't roast the meat from above, sizzle the sauce on one side and then the other. The sauce will actually sizzle and bubble. Stand by your grill and watch because sweet sauce can go from caramelized to carbonized in less than a minute! One coat of a thick sauce should be enough, but if you need two, go ahead, but don't hide all the fabulous flavors under too much sauce. If you think you'll want more sauce, put some in a bowl on the table. If you've done all this right, you will notice that there is a thin pink layer beneath the surface of the meat. This does not mean it is undercooked! It is the highly prized smoke ring caused by the combustion gases and the smoke. It is a sign of Amazing Ribs. Now be ready to take a bow when the applause swells from the audience. Here's a video from our fan Jason King that shows the whole process. 1 smoker or grill with a lid. You can use a dedicated smoker or any charcoal grill or gas grill as long as it has a lid. A tight fitting lid with adjustable vents like those on the Weber Kettle is best. 1 (18 pound) bag of charcoal for charcoal grills or smokers. You won't use all that charcoal, but because you will need more on cold, windy, or wet days than on sunny and warm days, have a full bag on hand. I prefer briquets (read my article on charcoal to see why). Absolutely do not use the instant igniting stuff that has solvent in it. Chimney starters are by far the best way to start charcoal, especially for long slow cooking where the smell of the solvent in charcoal starter fluid can ruin the taste of the meat. Read my article on how to start a charcoal fire. 1 tank of propane for gas cookers. You won't need it all, but, until you get the hang of this technique, don't risk running out by starting with a partial tank. A lot of folks boil their ribs before grilling them and slathering on the sauce. The concept comes from Eastern Europe where Poles and Czechs prepare ribs by simmering them in water with cabbage, potatoes, carrots, and caraway seed, making a very nice pork stew. But water is a solvent. It pulls much of the flavor out of the meat, and it can make the meat mushy. When you boil meat and bones, you make a rich flavorful soup. All that color in the pot is flavor that you can never get back into the meat. Boil meat too much and water can even dry it out by causing the proteins to contract and squeeze the moisture out of the muscle fibers. People talk wistfully about meat that falls off the bone, but if it does, it has probably been boiled and denuded of its best flavors. What they're really loving is the unctuous barbecue sauce. That's why McRibs are so popular. They're just ground pork swimming in sweetened ketchup mixed with liquid smoke and some other flavors. Classic Southern ribs have the same mouthfeel and bite as a tender juicy steak and most important, they taste like pork, not just sauce. They tug off the bone rather than fall off the bone. If you are really really in a hurry, you are better off steaming or microwaving them and then finishing them on the grill or under the broiler. Click here for my complete definition of Amazing BBQ Ribs, what I look for when I judge barbecue ribs in competitions. This recipe needed a name when I first published it, and Doug and Trudy Calvin of Palm Springs, CA provided it. He wrote "I fixed ribs yesterday by following your recipe. My girlfriend made me promise that for her last meal on this planet I would fix the same ribs." Vermont Pig Candy. The secret is mmmmmmaple syrup. Tuscan Marinated Ribs. This recipe calls for marinating the meat in an herbed oil and vinegar bath and roasting without smoke. The results are complex and exotic. Competition ribs. Here are the tweaks the top competitors do to win big money. Sous-Vide-Que Ribs. Amazingly tender and juicy. Soy Ginger Glazed Ribs. Sweet, salty, tangy. Rib Sandwich. Far better than McRib. Rendezvous Ribs. How they make ribs fast at the famous Rendezvous restaurant in Memphis. There are several very good recipes for dorm dwellers, folks with no grills, and for blizzard days. Smoky Sauna Indoor Ribs. This recipe takes the concepts of this recipe and adapts them for your indoor oven. Cabin Fever Slow Cooker Ribs. Toss these in your slowcooker and let them braise all day. Their fragrance will knock you over when you come home. Chinatown Char Siu Ribs. Everybody loves those Chinese restaurant ribs. How do they do it? The secret is not the sauce, it's the marinade. You can do them at home on the grill or in the oven. Hoisinful Nine Dragon Ribs. These may be the best Chinese ribs you ever tasted. And you can cook them indoors. Chinese Five Spice Riblets. Fried and crispy, flavored with five spice powder, these ribs are the perfect finger food for parties. Best Stovetop Ribs: Mexican Ribs with Rice. Arroz con Costillas de Cerdo is a great stove-top recipe with ribs swimming in a lush, juicy sauce on a bed of rice. The best advice I will ever give you: Develop a relationship with your butcher. On baby back ribs are cut from the loin meat, the amount of meat on the baby backs is determined by your butcher. Most grocers and butcher shops get their baby backs pre-cut in boxes, and the amount of meat on the ribs is determined by the price the store feels it can charge, and what the competition forces them to charge. Even if they get their baby backs pre-cut, many butchers also get whole bone-in rib roasts. If you ask nicely, your butcher may be willing to custom cut the baby back ribs off the rib roast leaving extra meat on them. Want baby backs with 1/2" of meat on top? No problem? Want a whole inch? No problem. Expect to pay more for these extra meaty ribs, but the result is worth it. A better option: Just buy the whole bone-in rib roast and then ask the butcher to remove the baby backs leaving about 1/2" of meat on them. Then keep the de-boned loin meat for roasting separately. Yummmmmm!